A renovated 18th Century cloth trading hall recorded a higher than expected deficit of more than £850,000 in the first year after it re-opened. 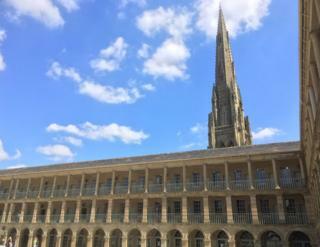 Halifax's Piece Hall had an operating deficit of £855,142, according to its first annual report and accounts. It has been partly blamed on the re-opening being delayed several times since a £19m restoration began in 2014. The Grade I listed building had about three million visitors in the 12 months since it opened in August 2017. The building was built in 1779 as a trading centre for handloom weavers selling "pieces" of locally-made cloth. The original 315 units in the arcades (once used for storing and trading the cloth) now contain new shops, cafes and offices. The hall reflects the important historic role played by the woollen trade in the town. The Piece Hall Trust's trustees report said the deficit was larger-than-expected, and that it was due to unforeseen one-off costs, increased fixed costs and the delay in opening. "To date, there have been numerous problems with the completion of the building renovation, which has restricted the ability to rent units to tenants as early as projected in the business plan", the report said. A Calderdale Council and Halifax Piece Hall Trust statement said a deficit was anticipated and it would take time to build up business, reported the Local Democracy Reporting Service. The hall costs £5,000 a day to run and a fundraising strategy has being created, said the trustees. The trust is to receive council funding of £2.75m over seven years, "front-loaded" to cover the higher costs in the first three to four years.